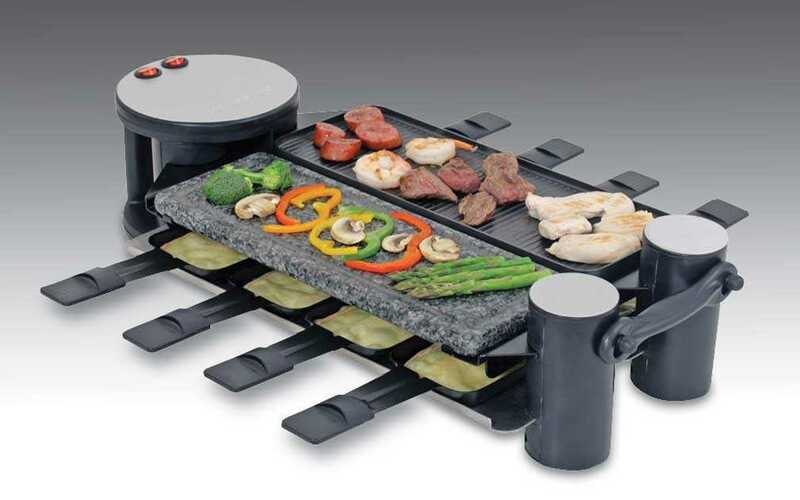 8 Person Party Raclette Grill - versatile usage; unfolds up to 180°. With stone and cast aluminum non-stick grill plates, black base, stainless steel tray. Separate power controls for each grill side. Includes 8 non-stick Raclette dishes, 8 heat-resistant spatulas and user manual with recipes. 1200W / 120V / 60Hz. The grill measures 22” x 9.75” x 5” To purchase your Raclette cheese, be sure to go to www.alpanddellcheese.com to check out their selection of fine cheeses. Service Area: New Glarus, Beloit, Madison, Freeport, Rockford, Middleton, Stoughton, Fort Atkinson, Platteville, Verona, De Forest and surrounding communities.